Those interested in ‘subordination’ or its absence, and eternal begottenness Nicea -style, ought to take a look at what Warfield has to say about such questions. Below is a section toward the end of his paper ‘The Biblical Doctrine of the Trinity’ (Biblical Doctrines). The paper can be downloaded as a PDF by Googling it. In keeping with the theme, I've split up the section into three consecutive parts, as Warfield’s stately, compressed style needs to be read carefully. 1. ‘Son’ and Spirit’ may seem to be obviously subordinate expressions. But this is not the semitic way of understanding these terms. 2. Sonship in 'only begotten Son' is simply ‘likeness’. Whatever the Father is the Son is also. It is thus an assertion of equality with the Father, and not of subordination. 3. So expressions of the ‘begottenness’ of the Son may convey no suggestion of coming into being, but of the Father's priority of existence. And similarly with ‘Spirit’. 4. There are in the NT almost full definitions of Sonship – in John.5.18 – and of Spirit – in I Cor. 2. 10 -11. – that are non-subordinationist. So what of the subordinationist language in the NT? 1. In the NT there is subordination in the ‘modes of operation’ of the persons in respect of redemption, but it is ‘not so clear’ that there is subordination in each person’s ‘mode of subsistence’, the way in which the person’s are related to each other. 2 It may be that the subordination in respect of redemption rests on subordination in modes of existence, but it might equally well be based not on nature but on convention, a one-willed convention of a covenantal character. And it looks that way because of the pervasiveness of the NT teaching on the Covenant of Redemption, on the humiliation of Christ, and on the two-natured character of Christ. 3. But this must be understood as being not at the expense of the NT’s teaching on the ‘complete identity’ of the three persons in their being and powers. The three are one God. 1. The threefold work of God in redemption is echoed and thus borne out in Christian experience. 2. The Christian finds the doctrine of the Trinity underlying and giving their significance and consistency to the teaching of the Scriptures as to the processes of salvation. 3. So the doctrine of the Trinity and the doctrine of redemption stand or fall together. So if Warfield is correct, what he says affects the theory that the Son is subordinate, being begotten, but subordinate only by a convention, the Persons' co-willingness, the willingness of one eternal will, to take different roles in redemption. The news that Thomas à Becket’s elbow – a Roman Catholic relic – has arrived in the UK from Hungary set me thinking about the Two Kingdoms again. It is said to contain a fragment of St Thomas à Becket’s elbow. And if you go to St Thomas Canterbury Catholic Church, Burgate, Canterbury, there you can see fragments bone and finger in a glass case above the altar. In Rome there are fragments of bone and brain. Apparently bones and a skull were discovered in 1888 but a later study concluded the skull was that of an older man. The veneration of relics is part of the Roman Catholic practice of praying to the saints. The cult of Becket was one of the chief casualties of the Reformation; there was the 1538 Proclamation which mentioned, inter alia, that his image was to be ‘put down and avoided out of all churches, chapels and other places’. 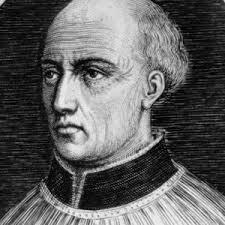 His name was to be erased from all liturgical books and his office, antiphons and collects were to be said no more, ‘to the intent that his grace’s loving subjects shall be no longer blindly led and abused to commit idolatry’. All this called to mind of Calvin’s letter to Cardinal Sadoleto, The Necessity of Reforming the Church. Sadoleto had written to the City of Geneva, which Calvin responded to by a letter of his own. And then he produced his famous tract. In both of these productions he refers in scathing and amusing terms to the place of relics in the Roman church. As to the matter of relics it is almost incredible how impudently the world has been cheated. I can mention three relics of our Saviour’s circumcision; likewise fourteen nails which are exhibited for the three by which he was fixed to the cross; three robes for that seamless one on which the soldiers case lots; two inscriptions that were placed over the cross; three spears by which our Saviour’s side was pierced, and about five sets of linen clothes which wrapt his body in the tomb. Besides, they show all the articles used at the institution of the Lord’s Supper, and an infinite number of similar impositions. There is no saint of any celebrity of which two or three bodies are not in existence. I can name the place where a piece of pumice stone was long held in high veneration as the skull of Peter. Whatever the theology behind the place of relics, their multiplication has one proximate cause: demand and supply. The supply was a sure generator of wealth, hence the supply, the ridiculous over- supply. While we may now smile at this trade, the oppressive regime of Saints Days and Holy Days in late medievalism was not such a laughing matter. A Saint’s Day then was not like a Saint’s day today, or a Bank Holiday. Or even the celebration of Christmas and Easter, which insofar as they retain a religious caste have to do with re-enacting these events, not recognizing the importance of the fact that they are ‘accomplished’, non-repeatable and intrinsically so. The One Kingdom view holds that the medieval church in which state and church were intertwined or colluded in the government of the laity by producing a culture that had totalitarian features. Resistance to the ecclesiastical claims of Rome undermined the divine right to add the requirements of Saints Days and Holy Days and such like, making observance of them an intrinsic duty of the Christian life. One of the things that news items of such relics, elbows, shrouds or pumice stone, is to value the clearer view of the distinctness of state and church that reformers such as Calvin arrived at, and how that view has prevailed and indeed been secularised in the modern world. Freedom is not simply the freedom to do what I want to do, as the modern libertarian doctrine has it. Libertarianism is potentially oppressive if large numbers of people want the same things, as we are seeing. The almost inevitable effect of the enjoyment of freedom is to restrict opportunities for the expression of views other than one's own that we find disturbing. When John Stuart Mill wrote his Liberty, arguing for toleration against the ‘tyranny of the majority’ he, like other writers such as Matthew Arnold, had the evangelical culture of their day in mind, the ‘Philistines’. They had a point. Not only absolute monarchs or modern dictators are capable of being tyrannical. It can come through a kind of cultural hegemony making the expression of different points of view socially forbidden via the ‘social media’ as well as other less ‘social’ kinds of media. Christian groups like the Christian Institute and others do well to ally with comedians and all else to uphold freedom of expression. Now living as a distinct minority, the Christians, in what was once termed ‘Christian England’ will inevitably make us increasingly aware of the reduction of the opportunities in which Christians can give pubic expression to their faith, or even to be seen to hold the faith. The current focus on the Two Kingdoms has been on secular society and the fact that it is distinct from the church. That’s freedom, we rightly think, to be free from such things as the obligation to transform culture in the name of Christ. But actually it is only one side of freedom. Christian freedom has not only to do what we are commanded to do or to abstain from doing by the government of the day, but also from what some church or sect, or social group or cultural mood, may try to require of us, or do require of us, that would be sinful. Not permitted by the Word of God, but forbidden by it.